Over the years I’ve used dropbox as a quick way to publish webpages. many of which I’ve linked to from post here. I’ve got plenty of other places to post to the web but for some things and some wee projects it has been very convenient to drop html files into my dropbox’s public folder they are published. 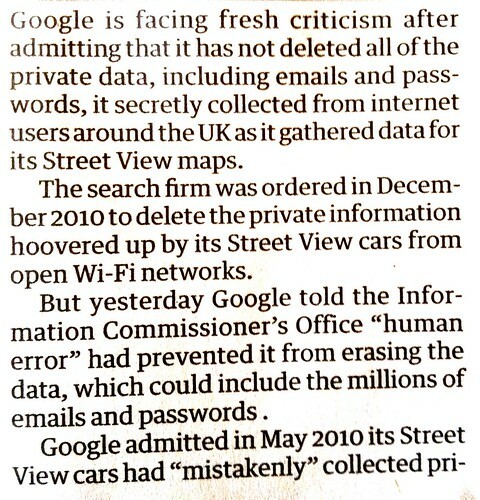 Google Drive did something similar at the end of August this year. I believe that both services removed this feature because of abuse. A great pity. It will have broken quite a few links I’ve posted. The most frequent use I made of this was a simple mashup of gpx files, google maps and flickr photo sets. It was on adding to this today I notice the breakage. I suppose I could try one of the services that publish your files in dropbox else where or set up some sort of script to upload things but any alternatives, ftp, surge, github etc that I’ve tried lack the simplicity. 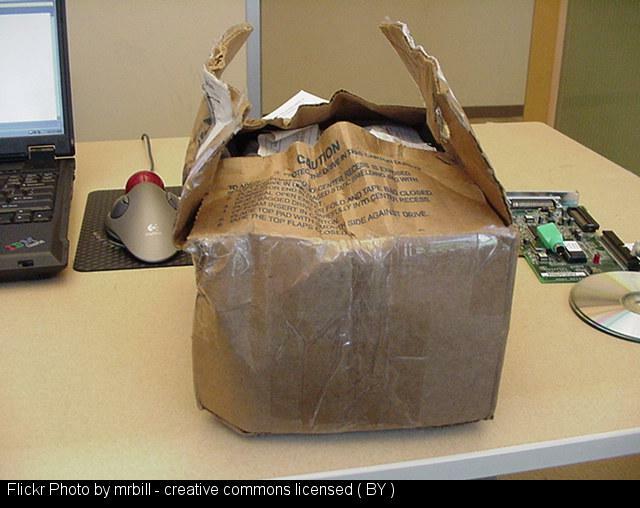 Featured image Beat-Up Box 3 | Bill Bradford | Flickr CC-BY. I like listening to podcasts. I usually listen to them while driving. I use instacast to play podcasts on my iPhone. Instacast allows you to subscribe to podcast feeds, it downloads episodes while you are on WiFi for playback later. I subscribe to a few educational podcast, some mac ones, the Scottish Poetry Library and Machine of Death. I change these about occasionally. Sometimes though I want to listen to individual podcasts episodes without subscribing to the whole feed. Recently I’ve been doing this by downloading the podcast media to dropbox, making the files favourites on my phone while on WiFi(which downloads them onto the phone) and listening later. To speed this up a bit and to allow me to do this from my phone or an ipad I have a folder in my dropbox with an AppleScript Folder Action attached to the folder. I add a text file with the url to a media file to this folder (typically with droptext) and it is automatically downloaded to my desktop in a dropbox folder. I then can favourite etc as normal. This still leaves a bit to be desired, I need to remember to favourite the files while on Wifi so that they are ready to play in the car. Huffduffer looks like it is made to solve this problem. It is a service that allows you to create a podcast feed from episodes of different podcasts or just mp3 files found on the web. You use a bookmarklet which finds any mp3 files on the current webpage and adds them to your podcast. Earlier this week I saw a link to huffduffer and created an account: Johnjohnston on Huffduffer. The only problem is I created the account on my phone and left it a few days to install the bookmarklet on my desktop. By then I had forgotten the password! So today I decided to try a wee bit of DIY with AppleScript. I’ve already got a few dropbox folders set up with Folder actions to do some automation 1 so had a rough idea of how to go about this. What I want to do is, on iOS copy the url to a webpage, switch to droptext, make a new text file containing the url and save it into the folder. The Folder Action script then parses the webpage for mp3 and m4a files and adds them to a RSS file. I’ve describe to this file in instacast so don’t need to think about it much other than opening instacast when on wifi and letting it download episodes. RFC 822 Dates with AppleScript | Joe Maller. As you can see, the feed is quite minimal, the names come from the mp3 file name. The script (I’ve uploaded it here), needs lots of work. I briefly tried to get the titles from the tile of the webpage, but ran into some odd characters which threw things off. I’ve also hard coded file paths into the script and it would be better not too. 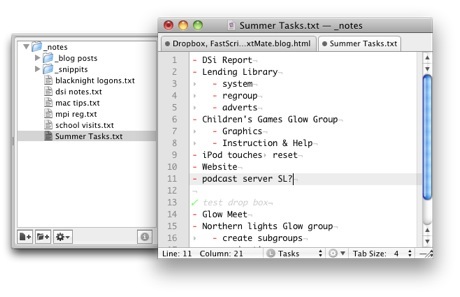 Most of the script, dealing with detecting the files added is a lift form the examples that Apple ship. My bit just process the url. 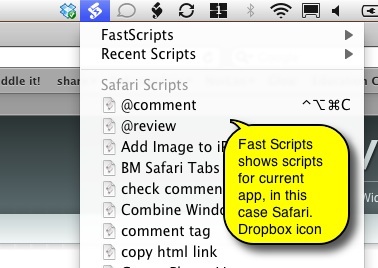 I’ve also adapt this to run from a mac grabbing the front url from Safari, this script is in my FastScripts folder s oI can run it with a keyboard shortcut. Not sure if anyone is interested in this stuff here, but it fascinates me and posting it is one way of keeping track. This is a quick test of a alternative way to post to my blog. a Folder Action AppleScript on this folder on my always on work mac. 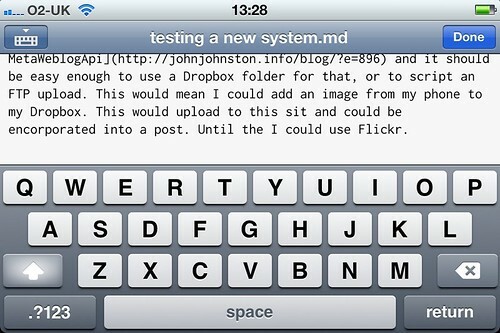 The MetaweblogAPI enabled on this blog and supported by AppleScript. When a file arrives on Dropbox and syncs to my work mac the Folder Action AppleScript posts it to my blog. It uses the first line of the file as a title. If the file is HTML it posts that, if it is markdown it converts it to HTML first. This post was created with [NOCs](http://www.wisd.com/) on my iPhone. Once I’ve finished a local, iPhone, draft NOCs allows me to move it to any Dropbox folder. About 6 years show I was testing posting images via the MetaWeblogApi and it should be easy enough to use a Dropbox folder for that, or to script an FTP upload. This would mean I could add an image from my phone to my Dropbox. This would upload to this sit and could be encorporated into a post. Until the I could use Flickr. I am not sure if anyone is very interested in this sort of thing. If they are I’ll be able to post more details from a desktop. This is about as long a post as I’d like to write on a phone. Not quite perfect yet, I had to edit the img tag here. More fun to be had. Update: it was like magic watching my home mac when posting this from my phone, growl told me that a file had been addd to my dropbox and almost immediately that a file had ben moved (by the work mac).